With the arrival of spring, we’re finding that many homeowners around the metro area are looking to make some changes in their landscaping. 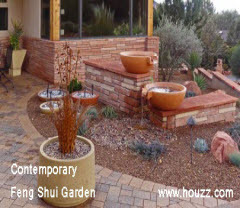 Are you among those seeking a way to come up with a beautiful and harmonious design for your yard? Many properties around the Minneapolis and St. Paul area reflect that harmony through the use of the Eastern concept of Feng Shui. While this philosophy applies to just about any aspect of design, in this post we’ll focus on how its principles can be used in landscape design. Protecting the house, backyard and garden from negative environmental impacts is a vital component of Feng Shui. Doing so provides a natural barrier for privacy. It is recommended that you surround your garden with a natural fence that cuts down on wind, noise and air pollution. These options would include wood, stone, and dense shrubs planted as hedges. Properly placed Feng Shui landscaping ideas tend to include elements that foster a sense of comfort and security. Stone wall, large rocks and rock gardens are helpful in accomplishing this. Creating wide open spaces with flowers, shrubs and small plants accenting pathways and rock- or sand-filled beds is a highly effective way to allow the energy of chi to flow freely around your garden. Additionally, creating an open space in front of house doors can similarly allow this energy to flow inside and around the house. For this reason it is recommended that you do not plant large trees near the front door. Feng Shui basic elements are intended to promote positive effects in your life For example, if you like the idea of bringing money into your home, according to Feng Shui design, including the element of water is something you should try. Among the many options are: a swimming pool, a reflecting pond with plants, or a koi pond with live fish. Waterfalls and fountains work as well. Here are a few waterscape ideas to get you started. These are only a few of the many basic ideas of Feng Shui that can be implemented into your garden and home. Whatever your philosophical approach to life and your personal tastes, we can customize your landscape plan to reflect the things that matter to you. Unique garden design and installation for Minneapolis and St. Paul MN area homeowners is just one of the many services offered by our MN landscaping company. We are currently offering a free design consultation – call us today to discuss how we can make Feng Shui (or any other garden design approach) work for your yard.